Object-oriented design and analysis provides tools for understanding and building complex software systems. This article is an excerpt from Object-Oriented Analysis and Design with Applications, 3rd Edition, by Grady Booch, Robert A. Maksimchuk, Michael W. Engel, Bobbi J. Young, Jim Conallen, Kelli A. Houston. published by Addison Wesley Professional, copyright © 2007 Pearson Education. All rights reserved. Certainly, there will always be geniuses among us, people of extraordinary skill who can do the work of a handful of mere mortal developers, the software engineering equivalents of Frank Lloyd Wright or Leonardo da Vinci. These are the people whom we seek to deploy as our system architects: the ones who devise innovative idioms, mechanisms, and frameworks that others can use as the architectural foundations of other applications or systems. However, "The world is only sparsely populated with geniuses. There is no reason to believe that the software engineering community has an inordinately large proportion of them". Although there is a touch of genius in all of us, in the realm of industrial-strength software we cannot always rely on divine inspiration to carry us through. Therefore, we must consider more disciplined ways to master complexity. "The technique of mastering complexity has been known since ancient times: divide et impera (divide and rule)" . When designing a complex software system, it is essential to decompose it into smaller and smaller parts, each of which we may then refine independently. In this manner, we satisfy the very real constraint that exists on the channel capacity of human cognition: To understand any given level of a system, we need only comprehend a few parts (rather than all parts) at once. Indeed, as Parnas observes, intelligent decomposition directly addresses the inherent complexity of software by forcing a division of a system's state space . Most of us have been formally trained in the dogma of top-down structured design, and so we approach decomposition as a simple matter of algorithmic decomposition, wherein each module in the system denotes a major step in some overall process. Figure 13 is an example of one of the products of structured design, a structure chart that shows the relationships among various functional elements of the solution. 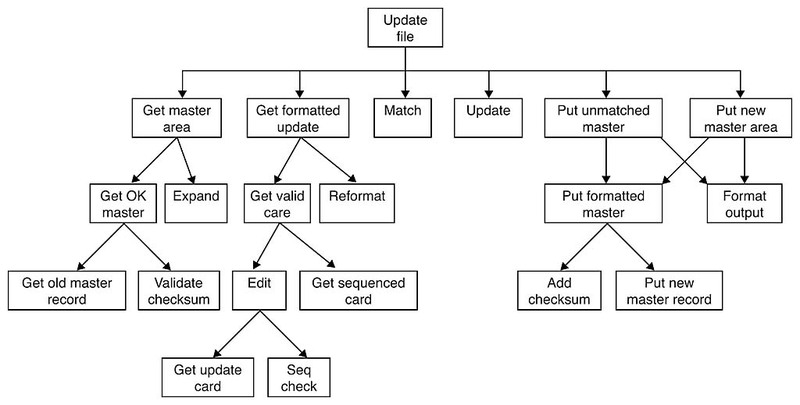 This particular structure chart illustrates part of the design of a program that updates the content of a master file. It was automatically generated from a data flow diagram by an expert system tool that embodies the rules of structured design . We suggest that there is an alternate decomposition possible for the same problem. In Figure 14, we have decomposed the system according to the key abstractions in the problem domain. 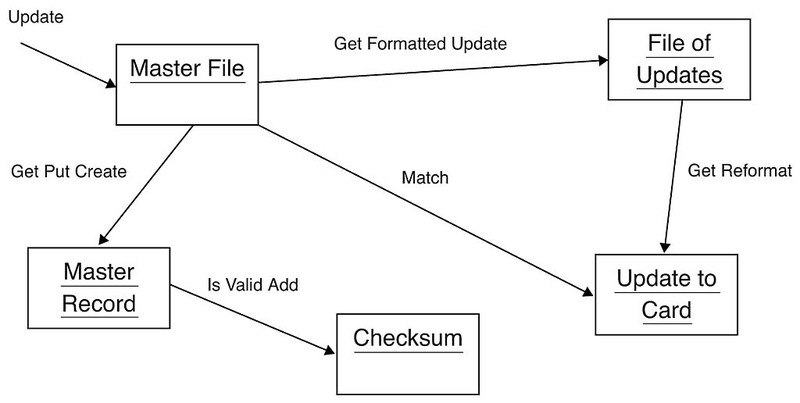 Rather than decomposing the problem into steps such as Get formatted update and Add checksum, we have identified objects such as Master File and Checksum, which derive directly from the vocabulary of the problem domain. Although both designs solve the same problem, they do so in quite different ways. In this second decomposition, we view the world as a set of autonomous agents that collaborate to perform some higher-level behavior. Get Formatted Update thus does not exist as an independent algorithm; rather, it is an operation associated with the object File of Updates. Calling this operation creates another object, Update to Card. In this manner, each object in our solution embodies its own unique behavior, and each one models some object in the real world. From this perspective, an object is simply a tangible entity that exhibits some well-defined behavior. Objects do things, and we ask them to perform what they do by sending them messages. Because our decomposition is based on objects and not algorithms, we call this an object-oriented decomposition. Which is the right way to decompose a complex systemby algorithms or by objects? Actually, this is a trick question because the right answer is that both views are important: The algorithmic view highlights the ordering of events, and the object-oriented view emphasizes the agents that either cause action or are the subjects on which these operations act. However, the fact remains that we cannot construct a complex system in both ways simultaneously, for they are completely orthogonal views. We must start decomposing a system either by algorithms or by objects and then use the resulting structure as the framework for expressing the other perspective. Our experience leads us to apply the object-oriented view first because this approach is better at helping us organize the inherent complexity of software systems, just as it helped us to describe the organized complexity of complex systems as diverse as computers, plants, galaxies, and large social institutions. Object-oriented decomposition has a number of highly significant advantages over algorithmic decomposition. Object-oriented decomposition yields smaller systems through the reuse of common mechanisms, thus providing an important economy of expression. Object-oriented systems are also more resilient to change and thus better able to evolve over time because their design is based on stable intermediate forms. Indeed, object-oriented decomposition greatly reduces the risk of building complex software systems because they are designed to evolve incrementally from smaller systems in which we already have confidence. Furthermore, object-oriented decomposition directly addresses the inherent complexity of software by helping us make intelligent decisions regarding the separation of concerns in a large state space. The sidebar in this article, Categories of Analysis and Design Methods, further compares and contrasts the object-oriented view with more traditional approaches to design. Experiments by psychologists, such as those of Miller, suggest that the maximum number of chunks of information that an individual can simultaneously comprehend is on the order of seven, plus or minus two. This number appears to be independent of information content. As Miller himself observes, "The span of absolute judgment and the span of immediate memory impose severe limitations on the amount of information that we are able to receive, process and remember. By organizing the stimulus input simultaneously into several dimensions and successively into a sequence of chunks, we manage to break . . . this informational bottleneck" . In contemporary terms, we call this process chunking or abstraction. As Wulf describes it, "We (humans) have developed an exceptionally powerful technique for dealing with complexity. We abstract from it. Unable to master the entirety of a complex object, we choose to ignore its inessential details, dealing instead with the generalized, idealized model of the object" . For example, when studying how photosynthesis works in a plant, we can focus on the chemical reactions in certain cells in a leaf and ignore all other parts, such as the roots and stems. We are still constrained by the number of things that we can comprehend at one time, but through abstraction, we use chunks of information with increasingly greater semantic content. This is especially true if we take an object-oriented view of the world because objects, as abstractions of entities in the real world, represent a particularly dense and cohesive clustering of information. Another way to increase the semantic content of individual chunks of information is by explicitly recognizing the class and object hierarchies within a complex software system. The object structure is important because it illustrates how different objects collaborate with one another through patterns of interaction that we call mechanisms. The class structure is equally important because it highlights common structure and behavior within a system. Thus, rather than study each individual photosynthesizing cell within a specific plant leaf, it is enough to study one such cell because we expect that all others will exhibit similar behavior. Although we treat each instance of a particular kind of object as distinct, we may assume that it shares the same behavior as all other instances of that same kind of object. By classifying objects into groups of related abstractions (e.g., kinds of plant cells versus animal cells), we come to explicitly distinguish the common and distinct properties of different objects, which further helps us to master their inherent complexity . Identifying the hierarchies within a complex software system is often not easy because it requires the discovery of patterns among many objects, each of which may embody some tremendously complicated behavior. Once we have exposed these hierarchies, however, the structure of a complex system, and in turn our understanding of it, becomes vastly simplified.